Transfer of a simple effective vacuum die casting technique named ZVAC® , to international die casting producers, for prevention of gas related porosity and surface quality defects. Gating and venting development for minimising porosity and die fill flow defects. Provision of technical support to designers, buyers, producers and finishers of diecastings. Continuously used in UK since 1990, and internationally since 2001. My vacuum technique really does stop gas problem porosity. In November 1990, faced with an extremely difficult porosity problem in zinc alloy high pressure diecastings for IBM, I designed and developed a very effective, economical low-cost, reliable and successful new vacuum technique. When commissioned in January 1991, it immediately saved the Company's most lucrative and prestigious order and reduced production costs. Initially, the technique was used on two 400 ton hot chamber diecasting machines at Dyson Diecastings Ltd.
Rejections for gas porosity and surface imperfections were immediately reduced from well above 40% to below 2%, and then with vent development and improved die sealing to below 1% (total after all secondary processes). Complaints and batch rejections from the customer ceased, and the product became very profitable. The need to get vacuum in the die as rapidly as possible led me to develop a new venting technique, which I called ZZVs (from zig zag vents). It was so effective and simple to apply, that the foundry manager had it cut into almost all standard (non-vacuum) dies. Within eight months, the vacuum system was extended into the aluminium foundry; initially, for newly acquired order for technically challenging heat-sinks with deep thin fins. The vacuum technique was progressively applied to new and existing dies to increase process yield, productivity and profits. The technique is now used in at other plants in UK, China, Canada, Colombia, USA, Iran and Egypt. Having for decades before using vacuum, optimised diecasting injection parameters, feed and vent geometries on thousands of dies to minimise porosities, the more I applied vacuum, the more I became convinced that when applied with due attention to die sealing, exhausting vents and ducting port sizes, vacuum provides the most powerful means for eliminating gas porosity in high pressure die castings. Sometimes, using vacuum enables shot speeds and metal pressures to be reduced from the days when very high speeds and pressures were used for squeezing gas bubbles to smallest possible size. The method creates relatively high vacuum in the die, and enables the number and size of overflows to be reduced; so reducing melting energy costs and carbon (CO2) emissions. It has been proven that vacuum has enabled thin die casting to be made with even thinner walls and still have excellent quality. This high vacuum diecasting method can even render remedial processes like impregnation unnecessary. 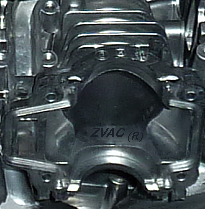 In 2004, the technique was named ZVAC®; an acronym derived from the radical geometry of its deep Zigzag VACuum channels. Initially, use of the vacuum technique was revealed only to customers, but after extensive use over six years, during the period that the Alumasc Group owned the Company, the valuable benefits of Dyson's ‘own-developed’ vacuum technique were proudly anounced in the group brochure and websites. (Note: In 2016, Broadways Stamplings Ltd. became proud new owners of Dyson Diecastings Ltd., following restructuring of the Alumasc Group.). In 1998, I published the fundamental principles and examples of my vacuum technique on the Internet, to promote my technical services. In 2001, the vacuum technique was installed in a Taiwanese owned large zinc diecasting facility in Shanghai, to improve quality of chrome plated zamak die-castings. In general, the greatest productivity and financial benefits of using vacuum for die casting are enjoyed when making parts that require expensive secondary finishing processes, such as: polishing, plating, powder painting, machining, impregnating, PVD coating with TiN, ZrN or CrN, or have demanding service structural requirements for strength and/or pressure tightness. © All images and scripts on this page and others on this website are, except where otherwise declared. copyright of Chris Hoskyns. All rights are reserved.